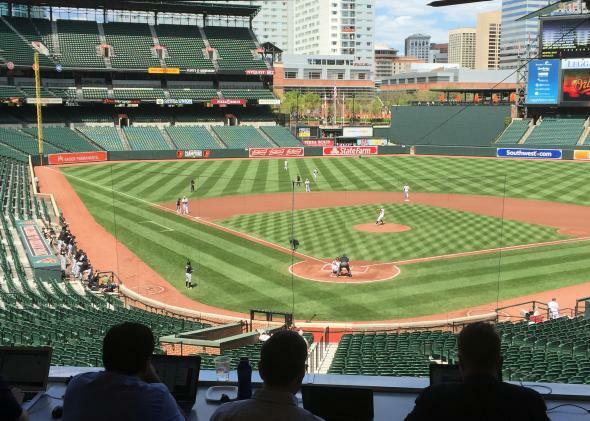 Baltimore Orioles-Chicago White Sox: What it's like at the historic, closed-door game. What if they threw a baseball game and nobody came? Photo by Mark Joseph Stern. BALTIMORE—The Baltimore Orioles and Chicago White Sox gathered on the field at Camden Yards on Wednesday afternoon to observe the Star-Spangled Banner. But as they stood with their hats in their hands, they gazed out over thousands of empty seats. Not a single fan was in the stadium—though a small crowd gathered behind the gate, cheering every small victory from afar. Wednesday’s closed-door game—the first in MLB history—is a result of the riots that have rocked the city over the last few days. The riots began as protests against the death of Freddie Gray, a young black man who was arrested and died after suffering injuries in police custody earlier this month. Since then, the protests have grown into a broader demonstration against police brutality, while the city has been beset by violence that caused the team to decide to hold today’s game with a record-low attendance of zero. So when Ubaldo Jimenez threw out the first pitch shortly after 2:05 p.m. EST on Wednesday, the few members of the press and team officials who were allowed in the stadium could hear every sound in the stadium, those distinctive baseball noises only directional mics can usually pick up: The sharp crack of the ball hitting the glove, the whiff of the bat through the air, and—when Chris Davis hit a three-run home run in the first inning—an audible thwack that echoed around the empty park. Everyone in the press box—where those of us reporting on the game are stuck for the duration—laughed nervously as we watched the ball fall. There was no scramble in the crowd to grab a souvenir, only a distant cheer from the group by the gate. The players rounded the bases. The game moved on. When I arrived at the park, I spoke to a few of the spectators watching from afar, none of whom seemed particularly fixated on the political or social significance of the closed-door game. 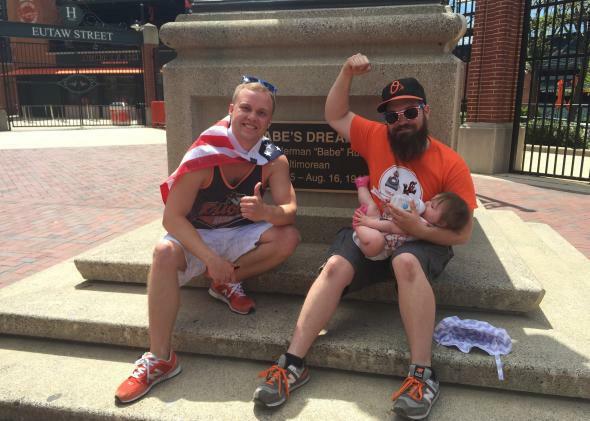 One, a father with his 6-month-old daughter, has been a season-ticket holder for 13 years, and didn’t want to miss a fun afternoon at the park. Another told me it was simply “too nice of a day” not to come out to Camden Yards. All of us in the press box are scrambling to churn out copy about what a closed-door match means for America today. The fans by the gate? They just want to see a good game. As for the game itself: Thanks in part to Davis’ shot, the O’s were able to run out to a 6-0 lead in the first inning that would indicate the players could just as easily put the sound of silence out of their minds as that of normally cacophonous crowds.